Started in 1998, with 2 children and now with nearly 2 decades of its presence it reaches out to over 1600 children. This organization - 'Vidya & Child' is a project managed by Jayaprakash Narayan Memorial Trust registered as a Public Charitable Trust in New Delhi, India. People who believe in his ideals and the work that he did, have constituted the Trust in his memory. The trust is registered u/s 12A and 80G of the Income Tax Act. 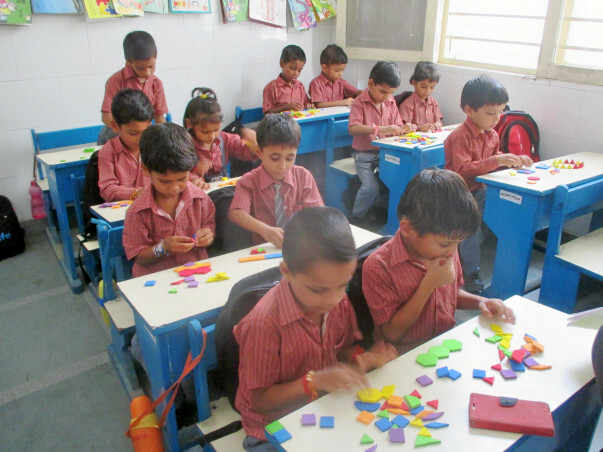 Vidya & Child works with the mission to help bridge the gap for those children who need education and have no access to the facilities for learning existing in our society. It aims to provide a learning environment which can lead to a strong educational foundation as well as help a child in identifying the uniqueness within and thus believes to strongly support this period in the child’s life. The process involves to enable the parent to believe that the child’s interests are being looked after and continue to offer opportunities as long as it takes for the child to be independent. 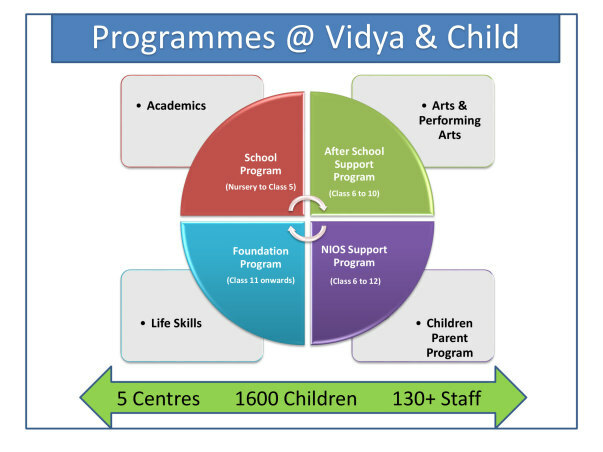 Vidya & Child extends its activity support to the children who are First Generation Learners and are residents of four - rural or semi urban cluster communities of Noida (Delhi NCR) and 1 center in Siwan, Bihar. Though each Location has distinct demographics yet they are primarily a mixed population from across different states constituting mainly of families who are either Illiterate of semi literate that have moved from villages to the cities for better livelihood opportunities. Thus they majorly form part of the unskilled labour force and their children who attend school are mostly First Generation Learners. Of the 1600 children across 5 centers, 375 children have been mainstreamed into formal schools and 110 children have finished Class XII and are pursuing higher studies. While many have been gainfully employed and are supporting their families. All these children are mostly first-generation learners. Over the last nineteen years, we have been able to connect with the parents and they now send their daughters too to study and learn at an early age. Thus ensuring equal opportunities for both boys and girls. Each child’s insatiable energy, determination to succeed and ever smiling faces is the driving force to improve on our inputs and reinforces our beliefs. Strong stakeholder involvement on a regular basis - especially parents. Strong volunteer participation, for the members of the support group. Equal ratio of Girls: Boys. Child friendly and Child Centric teaching Pedagogy. Teachers undergoing regular trainings both internal and external to make more teaching more comprehend-able for children and making use of more than one way of teaching the same concept. Overaged children are not barred to enroll in the education cycle, instead basis the child's ability to adapt/ pick up the child is put on a fast track mode so that he/ she can be mainstreamed in formal schools at the right age. Those unable to make it are not left out but are gainfully engaged through the NIOS (open school) programme. 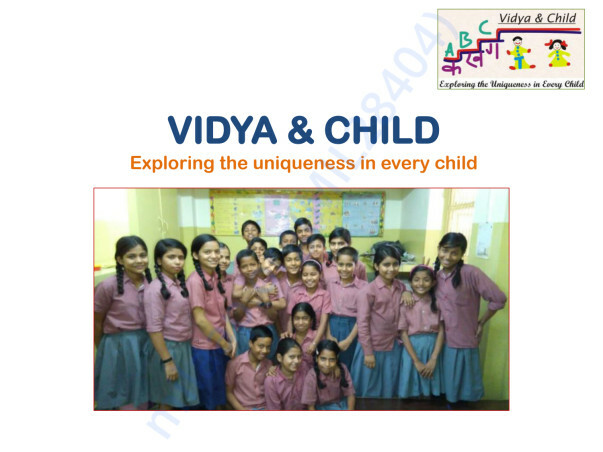 Value based based education forms the crux of the entire educational cycle at Vidya & Child and thus runs across all 4 programmes, beginning as early as in class 3 for each child. Career Guidance for the children in class 11th and onward. Though a brief introductory phase initiates from class 9th onward. Every child has a right to be educated. Every child has capabilities that need to be explored and channelized. Every child dreams and yearns to learn, to make a place for himself in society.